The Last Hunger Season is the story of four farm families in Western Kenya who are struggling to improve their livelihoods through agricultural development. Like millions of other smallholder farmers who wrestle with poor soils, tired seeds and fickle rains, Leonida, Francis, Ziborrah, and Rasoa live with a chronic, gnawing emptiness in their bellies. It is at its worst during the hunger season: the months when their previous harvest supplies run out and the new crop is yet to come in. 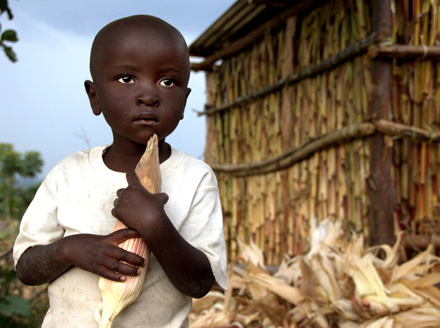 In this part of Kenya 10 percent of children die before their first birthdays, mostly from hunger and malnutrition. These four farmers have decided to try a likely — but far from guaranteed — solution. An organization called One Acre Fund (www.oneacrefund.org) offers to help them defeat their persistent hunger with improved seeds, fertilizer, training, and market access. It is a leap of faith, putting their trust in new technologies unavailable in the region until recently. As we grieve for their losses and cheer for their successes hope builds for the many like them who, by feeding their families, bring the promise of freedom from future famines to Africa — and the rest of the world.